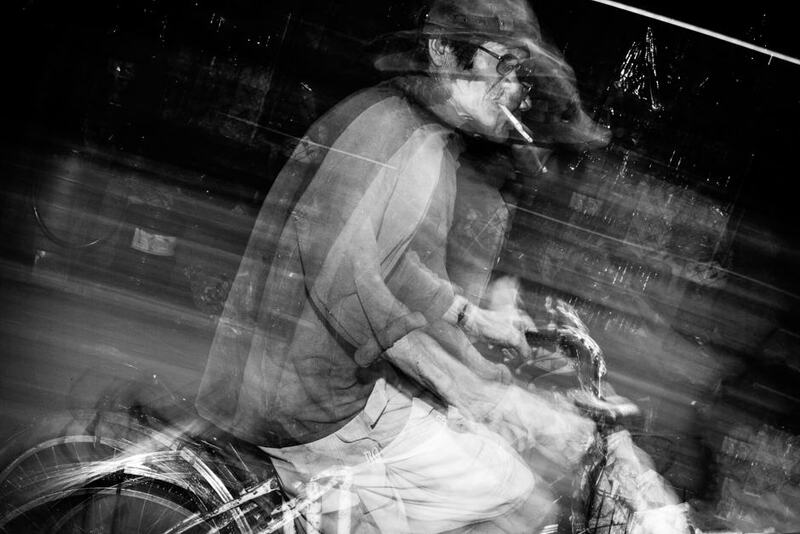 So, as ze French call it a “Filé”, there is something called panning, which can give an interesting look to your photos. It is a way to do more creative compositions, even though it is very easy to make too much of it, as myself do… well this year resolution was to try and make less of them, but I can’t help when I see an old woman on a bicycle! 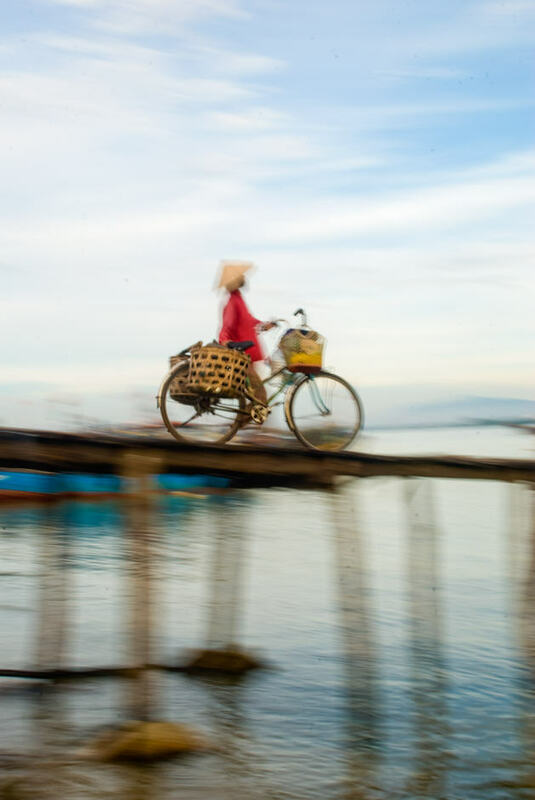 We see heaps of them during Hoi An photo Tour, so it is a great time to practice. 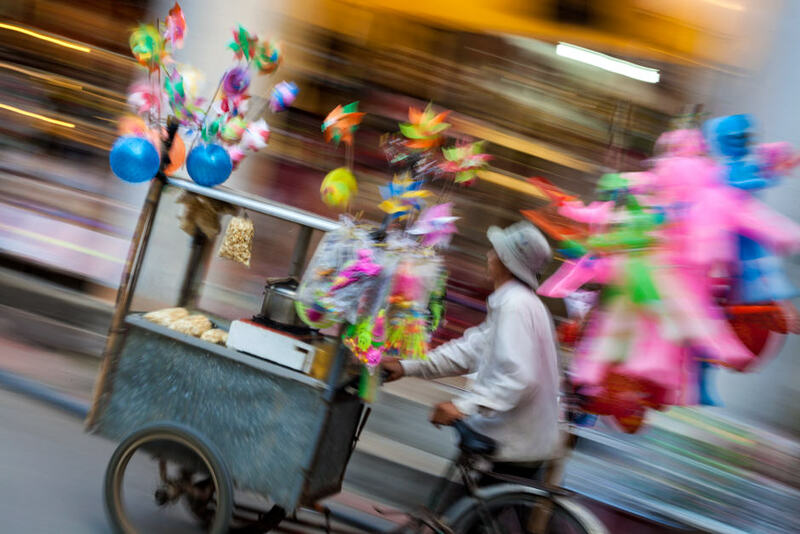 Panning refers as following your moving subject with the camera, using a slow shutter speed. That way the subject remains quite sharp, but your background gets all blurry and shaky. What I recommend for this is mostly to find a good subject (obvious!) but also a very interesting background. If you shoot with an overexposed sky in front of you, it may distract the eyes from the main subject. A dark wall or a dark green rice field might do it. Your subject of course should be interesting, but something that can be seen and enjoyed without details, as you never get the subject 100% sharp. 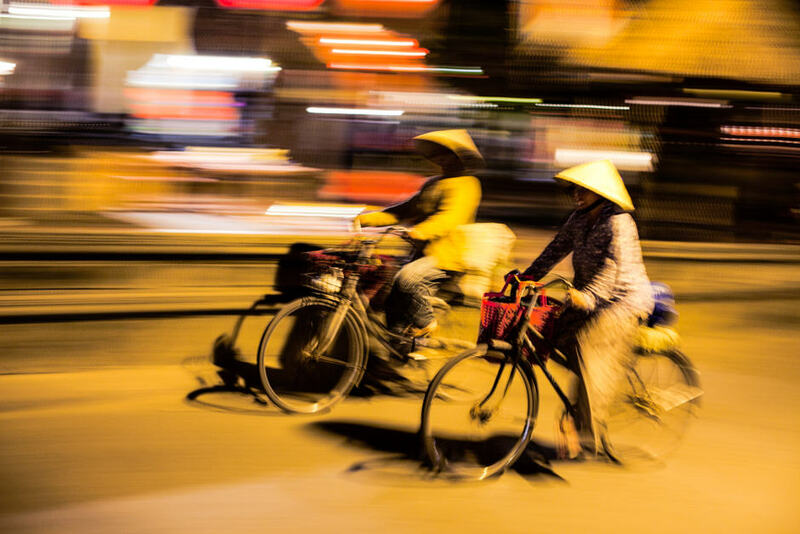 You lose many details (for example in the subject’s face) so find something which can be recognized quickly (this is why I like women on a bicycle wearing a Vietnamese hat). I personally don’t like to see pannings where the subject is too sharp, it looks fake to me. A bit of blurriness and distortion makes it more real! The basic way of doing it, first is to see your subject coming from far away, so you have time to get ready (you are not always shooting with a slow shutter speed). There are so many ways to get a slow shutter speed, what I like to do is to close my aperture to the maximum, in Av mode on my camera. This will avoid having an overexposed photo (if you have a slow shutter speed with a lot of light it will get overexposed). This is why it gets pretty difficult shooting panning when the sun is high, even with a very small aperture the shutter is not slow enough. So, seeing your subject coming from far away, reducing the size of your aperture until you reach a reasonable speed. For bicycles I like to use 1/4th or 1/5th of a second. 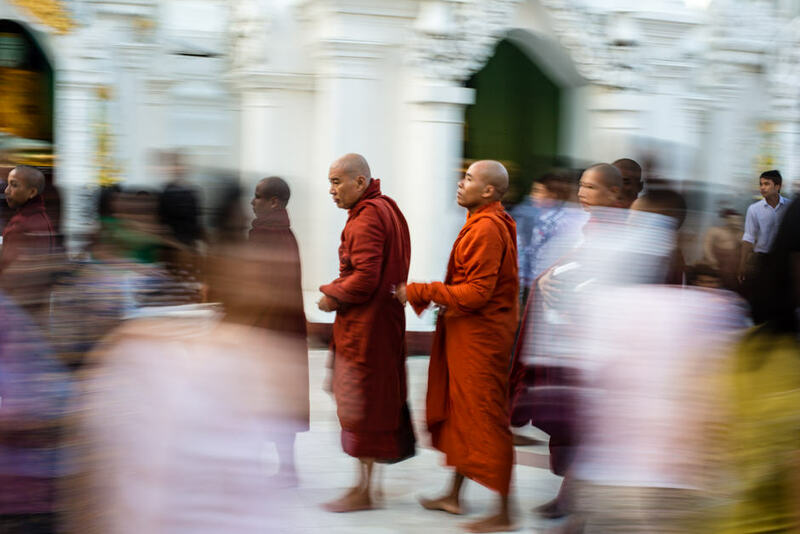 It makes it look good without being too difficult to realize, as the longer your shutter speed is, the more difficult it gets to get your subject quite sharp. Put your subject in the middle of your view finder to do the focus. Though I recommend to focus previously on the road, where the subject is going to be. But as things will be a bit blurry, it is ok if you are not super sharp. Yes, I am easy! Having your subject in your viewfinder, start following it with the camera, until you get the right speed. Then you press you shutter and try to keep following it the same speed. I say try as when you take the photo you can’t use your viewfinder anymore. Be careful though, as you have to move faster when the subject is close to you. Yes, you will need to practice before you get some good ones! Use something colorful as a subject, on a dull background, that will reinforce the subject. Sometimes, when I feel the hangover is too strong and my hands are shaky, I literally shoot from the hips. Hold you camera on your belly and follow the subject by moving your hips. Sometimes it makes it easier, and allows you to have a lower point of view. Once again, practice is key! 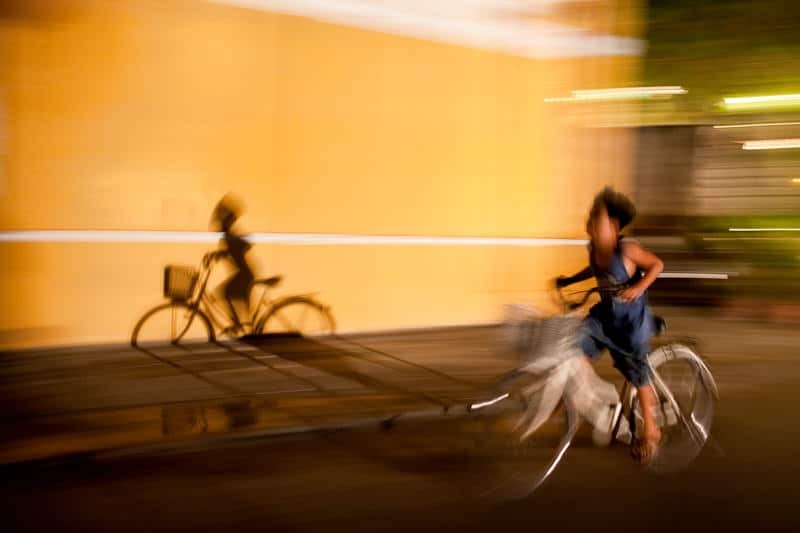 Another way to make panning is to use your flash. As the shutter is slow, the moment your flash triggers will print your subject on the photo. It will make the blurriness less obvious and make your subject a bit sharper. If you are using speed lights, you have the “Multi” function, which allows you to trigger multiple flashes for one exposure. This can make very interesting panning, where you will print your subject several times on the sensor. Generally, the longer the shutter speed, the better the panning (if done well). The key is practice, and finding the good subject and background.